We assessed differences in locoregional outcome based on receptor status combinations in a cohort of stage II–III breast cancer patients treated with modern trimodality therapy. 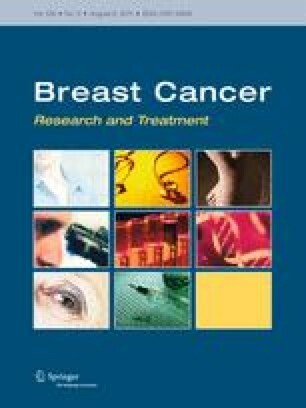 Medical records of 582 consecutively treated patients receiving post-mastectomy radiation (PMRT) between 1/1999 and 12/2009 were reviewed. Rate of local regional recurrence (LRR) was estimated by the method of cumulative incidence allowing for competing risks. The effect of prognostic factors was examined by Gray’s test and by Fine and Gray’s modeling approach. Median follow-up was 44.7 months. Five-year progression-free survival (PFS) was 73.9% and overall survival (OS) was 84%. The cumulative 5-year incidence of LRR as first site of failure was 6.2% (95% CI 4.2–8.7). Five-year cumulative incidence of LRR was 8.6 versus 4.4% for estrogen receptor (ER) negative versus ER positive (P = 0.017), 8.5 versus 3.4% for progesterone receptor (PR) negative versus PR positive (P = 0.011), and 1.7 versus 7.5% for HER2 positive (86% received trastuzamab) versus HER2 negative (P = 0.032). Five-year cumulative incidence of LRR was 11.8% for the triple negative subtype and 3.9% for other receptor combinations (P < 0.001). Among patients whose disease is ER positive, 5-year LRR rate was 7.8 versus 3.4% for PR negative versus PR positive (P = 0.130). The prognostic value of the triple negative and HER2 negative subtypes was maintained on multivariate analysis. In the era of HER-2 targeted therapy, tumors that are HER-2 over expressing and are treated with trastuzumab have a very low rate of LRR. ER negative, PR negative, and triple negative status are associated with increased risk of LRR. Presented in Poster Discussion Form at ASCO Breast Symposium, Washington, DC, October, 2010. The authors would like to acknowledge the contribution of Vijayalakshmi Gunaseelan, database manager, for her work in the development of the database used for this work. The authors have no disclaimer or disclosures.